F. P. Woll & Company has a full wood shop. 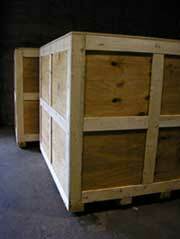 We can help you design and build any crate to meet your domestic or international shipping needs. We only use heat-treated wood and are certified monthly to meet IPPC-ISPM 15. Whether you need to meet government or mil-spec standards, or if you need a custom design for commercial and industry, F. P. Woll & Company can assist you in determining the most cost-effective solution.